There are some tentative signs that investor fears of an escalation of trade tensions are beginning to ease. A rebound in global equities overnight is offering the market some optimism of stabilization after last week’s rout. Global sovereign yields have also backed up, whilst the safe-haven yen (¥105.00) has slipped back from last weeks strongest print in more than 18-months and gold has trimmed some of last Friday’s advance. In this holiday shortened trading week there are a number of key releases with final Q4 GDP’s being released in France, the U.K. and the U.S. Elsewhere, for February, Japan will post its industrial production (IP), unemployment, retail sales and consumer prices. There are no central bank meetings scheduled for this week. In Europe, the March EC business and consumer confidence survey – important to the European Central Bank (ECB) – will be released. Stateside on Thursday, U.S. personal income and spending data for February are due to be released. Some of the recent risk aversion flow has retreated a tad in the overnight session, with dealers noting a “reduction” in the current phase of trade talks. Weekend reports noted that U.S. Treasury Secretary Mnuchin was more “optimistic” in reaching an agreement with China noted that recent conversations with China were “very productive”. That has helped lift the mood among investors, softening the safe-haven yen (¥105.00) in the process. The yen is down roughly -0.4% against its major peers with the EUR (€1.2411) and the pound adding +0.7% (£1.4220) each. Sterling remains supported as Brexit optimism and expectations of monetary policy tightening by the BoE continue to fuel investors’ demand for the currency. Note: BoE member, Gertjan Vlieghe’s, latest comments gave implicit support to the currently steeper U.K. rate curve.” Mr. Vlieghe said last week that there may be one or two rate hikes a year in this tightening cycle. The South African rand (ZAR) continues to find support after Moody’s kept South Africa’s investment grade rating on Friday and upgraded the country’s rating outlook from negative to stable. USD/ZAR ($11.6504) has fallen to a new one-month low. In Japan, stocks have rebounded from near-six-month intraday lows to finish strongly higher thanks to a roughly +0.5% pullback for the yen against some major global currencies. Overnight, the Nikkei finished at session highs in rising +0.7% – it was down -1.3% soon after the open. Despite concerns about U.S./China trade conflicts, buyers stepped in following the Nikkei’s -4.5% collapse Friday. Down-under, the Aussie ASX 200 closed at more than five-month low on Monday, down -0.5%, mirroring stateside losses amid lingering fears a potential U.S./China trade could hurt global growth and corporate earnings. In S. Korea, stocks rebounded strongly after first-hour weakness, with the market ultimately finishing at session highs. The Kospi rallied +0.8%, supported by chip firms Samsung and SK Hynix up +1.1%. In Hong Kong, stocks reversed earlier losses to end higher overnight, as trade war worries eased after reports the U.S. and China commenced talks to improve U.S. access to Chinese markets. At close of trade, the Hang Seng index was up +0.79%, while the Hang Seng China Enterprises index rose +0.57%. In China, a last-hour burst of buying in Chinese stocks, which had already rebounded from morning lows, helped the market look much better after Friday’s trade-fuelled slide. The Shenzhen Composite finished with a +1.3% gain after falling -2.3% earlier. However, ‘big caps’ remained down for the day, with the Shanghai Composite falling for a fourth consecutive session, declining -0.6%. In Europe, regional indices trade mostly higher across the board recovering from early weakness following a rebound in U.S. Equity futures after a sharp selloff on Friday. U.S. stocks are set to open deep in the ‘black’ (+1.1%). Crude oil futures have dipped early Monday on concerns of a looming trade dispute between the U.S./China weighed on global markets. Brent crude futures are at +$70.18 per barrel, down -27c, or -0.4%, while West Texas Intermediate (WTI) crude futures are at +$65.49 a barrel, down -39c, or -0.6%, from Friday’s close. Baker Hughes data last week showed that crude prices have also been weighed down by a rise in the number of U.S. rigs drilling for oil to a three-year high of 804, implying further rises in production – its already jumped by a quarter since mid-2016 to +10.4m bps. Note: In Asia, Shanghai crude oil futures debuted strongly, both in terms of volume and prices, with front-month contracts soaring as much as +6% as investors bought into the world’s newest financial oil trading instrument. Ahead of the U.S. open, gold prices have inched a tad lower from their five-week high hit earlier in the session, on profit-taking and as fears of a U.S./China trade war eased following reports of negotiations among two of the world’s leading economies. Spot gold is down -0.1% at +$1,346.01 per ounce. Note: Earlier in the session, gold prices climbed as much as +$1,350.76 per ounce, their highest since Feb. 19. 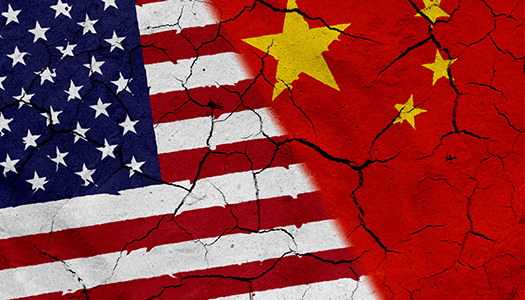 News of the U.S./China negotiating a possible ‘truce’ ahead of the imposition of tariffs is giving capital markets some hope that a trade war between the U.S. and China may not happen. In light of heightened trade and geopolitical tensions, the 10-year German bund yields remain well below the psychological +0.60% print. Early Monday, the 10-year Bund yield is trading at +0.53%, little changed from Friday’s closing level. With very little supply pressure this week in the eurozone, and month-end looming, fixed income dealers do not anticipate Euro yields to rally too far from current levels. Note: Today, Italy offers a total of up to +€5.5B in a new zero-coupon note and a new inflation-linked bond, while on Wednesday it offers up to +€7.5B in five- and 10-year conventional and seven-year floating-rate notes. Stateside, the U.S. Treasury is poised to bring to market this week its largest sale of debt ever – approximately +$294B of short-term paper. The yield on 10-year Treasuries has increased +3 bps to +2.85%. Elsewhere, the U.K’s 10-year yield has rallied +3 bps to +1.462%. Italy’s 5-star and League parties are said to have reach an agreement on election of parliamentary speakers. On Saturday, Mr. Di Maio and Mr. Salvini struck a deal to join forces in the parliamentary vote to elect speakers for the upper and lower houses — fuelling talk that they could team up to form a government in Rome. Roberto Fico was elected as President of the lower house and Forza Italia member Elisabetta Casellati as president of the Senate. Italian President Mattarella formally asked PM Gentiloni to resign on Saturday, Mar 24th (as expected). Note: An alliance between the populists Five-Star and the League, which is strongly Eurosceptic, is considered the worst scenario for E.U policymakers and investors. They fear it could lead to economic reforms introduced in recent years being reversed and defiance of Brussels on everything from budget rules to sanctions against Russia. In Spanish politics, police officials in Germany detained former Catalonia leader, Carles Puigdemont, on the weekend – acting on an international arrest warrant issued by a judge in Spain.